This fund was developed to provide short-term and immediate financial aid to women who are in crisis pregnancies, particularly those without other support systems in place, yet who have chosen to carry the pregnancy to term. By utilizing this fund, we can help women starting from their first contact with us, and keep total costs for adoptive parents reasonable. When you click on the green ‘Make a Donation’ button, please select ‘Expectant Mother Emergency Fund’ to contribute to the work of adoption. We strive to offer the benefits of adoption for the world’s most vulnerable children in our international programs. We spend countless hours exploring and developing new programs as opportunities arise, as well as much time and effort to maintain our existing programs. Where possible, we also support projects in foreign countries that provide ongoing care for children not eligible for adoption. This was established to provide much-needed financial assistance for adoptive families working with AAI who are facing unique and unexpected financial challenges related to their adoption process and who demonstrate financial need. Financial challenges are often related to the adoption of an older child, a child with special needs, or a sibling group. Financial challenges may also arise due to unexpected additional legal costs or significant delays in the overall process. This fund helps to ensure that those most vulnerable children get adopted. In our domestic program we are constantly looking for opportunities to provide accurate and useful information on the life-affirming option of adoption in and around our communities. It is our hope and prayer that anyone experiencing an unplanned pregnancy has ready access to accurate information about planning adoption. We reach out to schools, hospitals, community groups, churches, crisis pregnancy centers, clinics, and more, in our efforts to share information on adoption. Adoption Associates is grateful to be one of the non-profit organizations eligible to participate in the AmazonSmile program. The AmazonSmile Foundation will donate .5% of the purchase price from your eligible AmazonSmile purchases. The purchase price remains the same for you, and AAI receives a donation. Simply go to www.smile.amazon.com when shopping and select Adoption Associates as your charitable organization. Click HERE for the details. 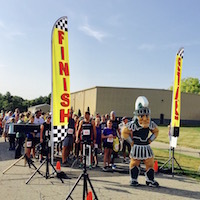 You may also choose to support Adoption Associates by participating in our annual Touched by Adoption 5K event held each summer in Portland, Michigan. Please call us at 800-677-2367 if you’d like more information about participating in this family event, or click on the Make a Donation button below.